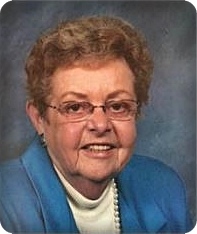 Helene M. DeHoek, age 86, of Grand Rapids, went home to be with her Lord on Sunday, May 13, 2018. She was preceded in death by her husband, Richard; great grandson, Ethan DeHoek; and brother, John Danhof. Helene will be lovingly remembered by her children, William (Rasa) DeHoek, Daniel (Marie) DeHoek, Roger (Susan) DeHoek, Robert (JoAnn) DeHoek; grandchildren, Matthew (Kaeta) DeHoek, Brian (Lindsey) DeHoek, Jonathan (Maggie) DeHoek, Lauren (Brian) Guttersen, R.J. DeHoek, Alison DeHoek, Andrew DeHoek, Michael DeHoek, Nicholas DeHoek; great grandchildren, Parker, Loralei, Hudson, Griffin, Dexter; brothers, Calvin (Kathryn) Danhof, Roger (Jan) Danhof; sisters-in-law, Joan Gordon, Barbara DeHoek; many nieces and nephews. Helene was a leap year baby, born on February 29, 1932. She lived her first few years in Pella, Iowa, where her father served as a Christian Reformed pastor, before moving on to Holland, and then to Grand Rapids in the early 1940's. It was while her father was pastor at Neland Avenue that she met her future husband, Richard DeHoek. Both she and Rich graduated from Grand Rapids Christian High School and Calvin College and were married in 1954. The next eight years were filled with making and raising a family, having four boys between 1955 and 1962. All four boys were active in school sports and played at Southern Little League. While raising her family, Helene began a twenty five year career as a Grand Rapids public school teacher, first at Vandenberg and then at Mulick Park. And, she managed to find time to get a Master Degree in Education from MSU. After retiring, Helene continued a full life. She and Rich had University of Michigan football season tickets, traveled to Europe, the Caribbean and many other places, attended countless school and sporting events for her grandchildren and seldom missed Wolverine football or a Detroit Tiger game on television. Even as she aged and became frail, she was mentally sharp and maintained an active schedule. Breakfast on Wednesday with girlfriends she met in grade school, daily phone calls to her brother, Cal, and many others, Sudoku and crossword puzzles and watching her great grandchildren, Parker at Southern Little League, and Loralei at Miracle League and Equest Center. Her home was filled with pictures and mementos of family and former students she stayed in touch with. Helene will be missed by her family and friends for her kind heart, incredible wit and the ever present opinion, which she was more than willing to share. Having lived a long and full Christian life, she is now in Heaven reunited with her husband, Richard. The family will greet visitors on Thursday from 6 - 8 pm at Stroo Funeral Home, where the funeral service will be held at 11 am Friday, May 18, with Rev. Ruth Boven, officiating. There will be an hour of visitation prior to the service. Interment in Blain Cemetery. Memorial contributions may be made to LaGrave Avenue Christian Reformed Church.